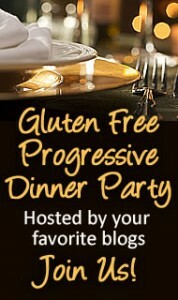 Welcome to the Frozen or Chilled Dessert day for our Gluten Free Dessert Progressive Dinner Party. I’ll be serving my Chocolate Sorbet with Chocolate Chunk and Roasted Chocolate Nibs. Chocolate is one of my favorite things to eat. I of course had to make a frozen chocolate dessert for the holidays. 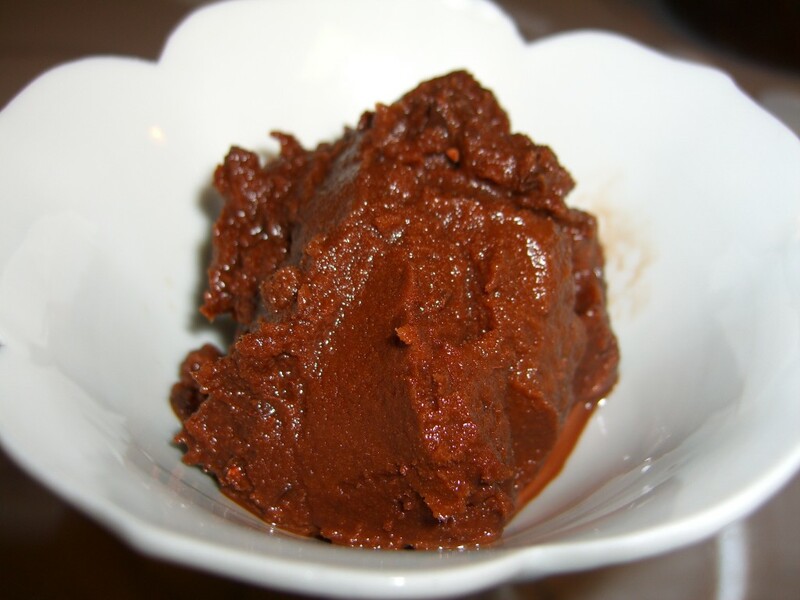 This Chocolate Sorbet with Roasted Chocolate Nibs is gluten free and dairy free. It is very easy to make and all you need is the will power to let it set up before you eat it and cold. This sorbet is a very rich chocolate dessert. With this recipe you can choose to leave out the pieces of candy or replace them with something else. I like hazelnuts or almonds in my chocolate and for the holidays peppermint is a favorite from candy canes. If you add solids make sure they are very small pieces. 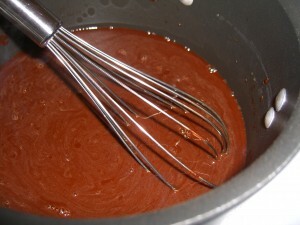 You can also add in espresso for that deep coffee flavor or spice it up with a little cayenne pepper. Really the possibilities are endless. I think the next time I make this I’ll make it plain. 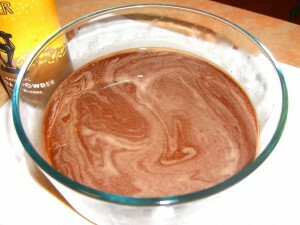 What do you like to mix into your frozen chocolate desserts? 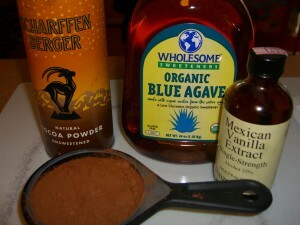 1/2 cup cocoa powder (use the really good stuff as it makes a huge difference) I used Schaffen Berger. 1/4 cup chopped chocolate candy bar with chocolate nibs (I used Alter Ego Fair Trade Chocolate Bar) gnosis chocolate is wonderful chocolate bars too! 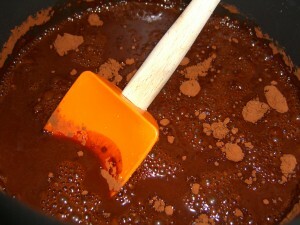 In a sauce pan heat up the water and agave until combined. Add in the vanilla and salt and combine. 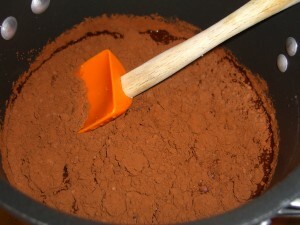 Now mix in your cocoa powder. You’ll want to heat this until totally mixed together. To get out the lumps use your whip. Pour into a container and put into the refrigerator until very cold. 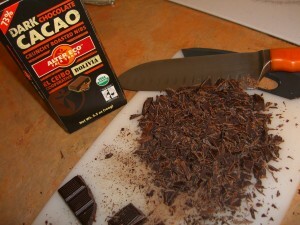 While you are waiting on that, you can chop up your chocolate bar or whatever you plan on adding to your sorbet. Now you are ready to add it into your ice cream maker. It usually will take around 20-30 minutes for this to set up but check the directions on your machine. 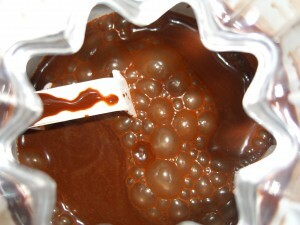 Three quarters of the way through this process, when it’s started to thicken, I add in the cut up chocolate candy bar. If you add it too early it will all sink to the bottom. I like the mix to have a little body before I add it in. You want to look for the mixture to thicken and look like a heavy slush. Now scoop it out of the cold insert and into a container you can put into the freezer. It can take anywhere from 1 hour to 4 hours to set up. This is not a large amount so it shouldn’t take long. Scoop it out and serve it with your favorite cookie or cup of hot tea or coffee. You can change up the chocolate candy bar. If you want to add in a coffee flavor replace 1/4 cup of water with 1/4 cup of espresso. If you don’t have an espresso machine around pick up a cup at the coffee shop. If you don’t have agave, you can use 1 cup of sugar instead. Make sure it melts and combines well. If you don’t have Mexican Vanilla you can use any vanilla extract except imitation. Check if it’s gluten free. This was also submitted to Slightly Indulgent Tuesdays! Monday December 7th Baked Desserts with Shauna- gluten free girl and the chef, Alison- Sure Foods Living and Ali- The Whole Life Nutrition Kitchen. Tuesday December 8th Frozen or Chilled Desserts with Shirley- gfe gluten free easily and me The W.H.O.L.E. Gang. Thursday December 10th No-Bake Desserts with me, The W.H.O.L.E. Gang. Friday December 11th Favorite Desserts with Melissa- Gluten Free For Good and Jean- Gluten Free Organics. Thank you Michele! Love the face on the smiley. 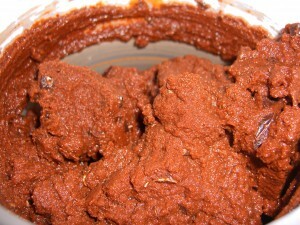 Now that chocolate sorbet … I swear I'd make some right now if I didn't have to head to work!!!! Awesome, Diane! Shirley- Thank you so much. I'll take that Margarita tonight! I'll save you one. I had a great birthday this year and part is due to all of the great wishes from you and others on the blog, twitter, facebook and emails. I feel so loved! Sounds delicious! I've just recently discovered cocoa nibs. Yum! Have you ever tried to make dairy-free ice cream with coconut milk? It's delicious – so rich and creamy you'll swear it's the full-dairy thing. Alta- Love ice cream made from coconut milk. So creamy. I was thrilled this sorbet worked with water. I like that calorie count! Ali- This was so easy and the calorie count low if you leave out the chocolate candy bar. It would work just fine without it. I think I've found my easy chocolate fix. This looks great! The best part is that I have all the ingredients to make it, and the ice cream maker. It may be dessert tonight. Thanks. Heather- Let me know if you gave this a try and if you changed anything up. Happy Birthday Diane! This looks fabulous =D. Lauren- Thank you so much on both accounts! I love chocolate sorbet and your step-by-step directions would be so helpful to anyone who's making it for the first time. Happy B-Day and thanks for linking to Slightly Indulgent Tuesdays! This looks so yummy! I wish I could eat chocolate right now! I really need to buy an ice cream maker so I can try this. It looks soooo good!